Last week I saw Fran, my author, “The Woman in the Black Toyota”. She was visiting the gas station across the street from me, chatting with the owner as his son filled her gas tank. I think the gas station man talks to her about what’s going on in the area, and maybe even about me (I like to think that)! I could see them looking my way, gesturing and nodding to each other. If I could, I would give her a big hug hello! It’s not unusual for Fran to drive by slowly, turn around and then park in front of me for a few minutes. She looks me over and often gets out to take pictures. I wonder what she’s thinking. Maybe she’s amazed, as I am, with all the changes that are happening to me. Not long ago she spotted a massive truck parked alongside me. She parked in front of me and I saw her car window open. I heard her ask one of the two workers heading into my front door if the owner was inside. He told her “No, but he should be back later”. She waited for a while, then left and I thought she seemed somewhat disappointed. I wonder if she’ll get to meet my new owner soon! I overheard Fran talking about something very special today and it’s all so terribly exciting! I can tell finally tell you as it’s now official that my story, FRED: Buffalo Building of Dreams, will be published by Buffalo Heritage Press in 2020! It’s been decades of challenges in the making to finally achieve publication, and there have been times when my goal seemed an almost impossible dream. But here I am, a one hundred nineteen-year-old survivor, anxiously awaiting 2020…my legacy year! Life is quite magical. Dear friends, my long journey from back in time taught me to be a good listener and silent observer of human behavior. My historical novel is a glimpse into the lives of generations of tenants from various parts of the world in search of personal and economic freedom in America. My observations helped me understand what it must be like to be human and shaped my destiny to share their legacy with current and future generations. They no longer have a voice. My author’s words speak on behalf of all of us. My tenants’ personal tales enriched my life beyond belief. They became family to me. I held their secrets, disappointments, grief, and was fortunate to share their many moments of joy and success within my walls. I was a silent member of their families, entering their lives without their knowledge, with the exception of one special young boy who grew up protected within my walls. I was able to connect with my tenants and their families, whose lives were impacted by historical events beyond their control. My firsthand history lessons are vivid and extensive as I imagine them in my mind’s eye, filled with unbelievable actual events. I learned about the Civil War, the Hooks, the Great Strike of 1899, the Suffragettes, World War 1, the right to vote, the Buffalo Children’s Aid Society, the News and Black Boot Boys, and major events that took place around the world during this 118-year period. You might ask me “Why is this story important?”. And, I will tell you. I am a survivor, a modest apartment building with a heart and soul and tales to tell. I’m still standing proudly like my tenants were when they first moved into my building. My hope is that readers will be able to step back in time and see themselves in the struggles and hopes, the heartaches and dreams, and the common humanity that all my tenants shared – and share with you. In a way I’m like my tenants. I have ups and downs, fears, unknown challenges, only I have no control over what happens to me. My fate is in my owner’s hands. How I wish I had the free will to make the types of choices my tenants made to survive and thrive. I rose up from the ground in a residential and industrial neighborhood on the West Side of Buffalo, New York and became aware of being built shortly after my four-story modest apartment building cornerstone was securely in place in 1900. I often noticed a young woman with a child in her arms, watching me daily, except when the weather was bad. The construction crew would wave and sometimes talk to them. It was quite confusing at first because I felt a warmth toward them both and felt alive. I’m privileged to be an eyewitness to many generations who lived in my building. The tenants living within my walls were from all over the world and had multiple twists, and turns, creating a journey of a lifetime. For decades I tried hard to connect with someone who would hear my plea; for someone who would write my legacy. In 2006, Fran, my author heard my cry for help as she drove by my building. My voice will take you back in time to meet and hear my characters talk, and live their lives, in their historical period. You’ll get to experience what their challenges were like and how they dealt with unpredictable lives. When you read this historical, multi-period novel about my life, FRED: Buffalo Building of Dreams, you’ll also find out how intertwined my tenants were over a span of 118 years. They were a mosaic of humanity and made this old building sometimes wish I really was human. Having lived as long as I have, my history actually takes place in the real-time lives of the immigrants, refugees, internal migrants, and descendants of enslaved Peoples of Africa who called me home. I’ve had my share of fear and disappointments too. One of my fears is of being destroyed or demolished before evidence of my existence can be documented, but I think almost everyone can relate to being fearful. I was a novice about life. Each decade provided new insights about how wars, poverty, political upheavals, and famines took a toll on many of my tenants. I learned that Freedom was their common goal. Their stories were often heartbreaking, but through them I experienced the real meaning of courage and how it never dies. I cried with them when I had no tears, smiled on the inside when they were happy. I’m excited about being published in 2020 (Buffalo Heritage Press) because it will allow me to share these unbelievable stories. When you read this book, you too will enter the lives of this mosaic of people and become part of their hopes and dreams. Perhaps you’ll also discover the secret their legacies reveal for the current and future generations of Americans. Having a voice of my own is new to me and frankly, I never really thought it would ever happen. I know we apartment buildings don’t typically talk. We usually only listen and exist to provide shelter to our tenants. When I think about my life and the lives of generations I was able to connect with, it does boggle my mind. Having the ability to share my tenants’ tales in the historical period they lived is miraculous and I know that it wouldn’t have happened if it also wasn’t for Fran’s co- researchers, Pat Smyton and Janet Mazzaroppi. The team of three, Fran, Pat, and Janet, called themselves the Orphan Building Research Team, but because of these three ladies, I definitely no longer feel orphaned. I also must tell you about Jane Hauser, who was my hero of a typist and rescued my author from her handwritten manuscript that needed multiple revisions. My opportunity to be published wouldn’t have happened if the major research wasn’t completed, and although it took a six-year period of time, it was worth the wait. Without my excellent super achiever researchers, Fran feels that this book project would have taken at least ten years to complete on her own. What I’ve also learned is that the research doesn’t stop, as there has even been a little more research completed during the content editing process. Pat S. was the first of the team to say yes to Fran’s invitation to become a historical researcher, followed quickly by a second yes from Janet M. They both had very busy lives, but slowly became dedicated through Fran, to finding out the reason I pleaded for help. Gradually, the research process unfolded and now they are all seasoned researchers. Fran, Pat, Janet, and Jane also now consider themselves the female version of the four Musketeers instead of three, which makes me smile. All this because of me, and I find that both amazing and humbling! I also must tell you about my special website creator, Christine Demcie, as she captured my purpose for living 118 years and made me come alive on my author’s website for the world to see. I can’t end this blog of thanks without sharing my appreciation and love for my “Fred’s Friends”, as their support has been invaluable. They are all listed on my website and I can’t believe that the list keeps growing! There’s so much more to tell you, but for this blog, I wanted to say thank you! In the Spring of 2006, she drove by me looking puzzled, at 8:15 a.m., on the busy Niagara Street on the West Side of Buffalo, New York I call home. When she turned with a lingering look in my direction, I thought maybe a miracle had occurred and hoped it wasn’t my imagination. For the next several years, I saw her black Toyota pass by me and noticed that she always turned her head in my direction. I would see her stop by weekly at Carm and Sal’s Gas Station, directly across the street from me. She would buy gas and visit for five or ten minutes, talking to either the father or the son who pumped her gas. I watched as they all would glance in my direction or point to the changes taking place on the outside of my building. Although I was unable to communicate with her directly, I knew she heard me, and I never gave up hope that she would tell my story. Time was taking its toll and I kept deteriorating a little bit at a time. I was becoming slightly desperate because I wanted to share my rich history with current and future generations before it was too late. I wanted people to have the opportunity to honor my tenants who were immigrants, refugees, internal migrants, and descendants of enslaved Peoples of Africa; their tales paying tribute to their struggle for freedom, and their lives proud legacies for current and future generations of Americans. Eventually, I found out that when she first saw me…heard me…she was shocked and couldn’t believe what had just happened to her. She rushed into her office which was not very far down the road from me, and scribbled down notes on a scrap pieces of paper. As the years passed by, she told everyone she worked with about me, Building #1469 on the corner of Niagara Street and Potomac Avenue. That was me before I got a real name. Fred. I’ll tell you more about how her research team emerged next time. I can’t wait. My Novice Novelist blog has now transitioned to FRED SPEAKS, a blog written through the voice of FRED: Buffalo Building of Dreams. Currently in the publication process, the book will be available in 2020 through Buffalo Heritage Press. Hi. My name is FRED and this is my very first blog. I’m an apartment building who has waited patiently to tell the story about many of the tenants who lived in my building from 1900-2018. I tried to get someone to listen, but it was decades before someone actually heard my plea. Finally, in 2006 Fran Schmidt, the woman in the black Toyota, heard my voice. It took her another six years to actually begin work on this multi-period historical fiction novel, but my story started to come to fruition in 2012 when she began writing about me. I want her to know I appreciate her, her research partners, and the new friends and acquaintances who believe in me and my tales. They all make me feel so alive! Great thanks also goes out to the Buffalo Heritage Press for publishing this novel in 2020. I am so excited that I’m actually still standing and currently undergoing a preservation process. My new apartments will be authentic and almost like they were when I was first built and will then be the home to a new generation of tenants with their own amazing stories! My own blog is launching now because I want my potential readers to be excited too. You will learn interesting historical information decade-by-decade…about how I came alive and lived vicariously through the lives of many of my immigrants, refugees, internal migrants, and descendants of enslaved peoples of Africa, They were German, Sicilian, Italian, Irish, Polish, Hungarian, Canadian, English, French, Puerto Rican, Jewish and African American. I provided shelter and comfort to my tenants after they had experienced extreme poverty and the effects of war and other traumas. Freedom was the common denominator that tied each generation of tenants together regardless of their backgrounds. I’m not human, but I have learned first-hand through these amazing people, what it’s like to be one. Hard work is now underway for this Novice Novelist. I’m currently making revisions and changes as suggested by my developmental editor and have a deadline of two months to complete my task. Yesterday I was able to spend a significant number of hours on the manuscript and will have hundreds more to go before I finish. There are many goals that must be achieved before Fred’s words will reach readers. It’s important to stay focused and I’m learning the importance of constructive feedback. It’s exciting and challenging at the same time, and I love revisiting Fred’s tale through the process. I’m only guessing how many hours it will take for me to finish working on Fred’s novel, but will spend as many hours as necessary to finish the work on time or earlier. How grateful I am to have expert advice. Writing a novel is a process that continues long after the book has been completed, revised several times, and pre-publication edited. I hope to tell Fred’s story with his strong voice filled with the emotions he felt by being a good listener. I’ve written Fred’s story longhand and have rewritten each chapter multiple times. I have to feel the words as I write them. Needless to say, I do have two fingers I use to write with that stand out from the others. I look at both and smile because there’s nothing I can do about it. If they feel stiff I bend them backwards and they are pen ready again. Somehow, I was selected to take this journey back in time. Before Fred’s voice spoke to me my books were nonfiction. Now I have an appreciation for history and have learned the importance of research. My characters are all important and Fred’s novel is a legacy of hope for all generations. My message to beginning historical novelists is to keep writing and work hard to get your story completed no matter how long it takes. It’s a journey with twists and turns before your widened path leads to a chance to move forward to publication. My pathway to publication finally opened wide when I signed an author contract with an excellent Western New York publisher, Marti Gorman, of Buffalo Heritage Press. When I left Marti’s office, I could have flown home if only I had wings! Before the good news happened, during our first meeting, I was asked if I was willing to make changes to the manuscript if necessary. “Yes” I said. “I’ll do anything I’m asked to do to make the manuscript “reader ready”. The publisher then said she would try to find the perfect developmental editor for FRED. It was hard to believe that after more than a decade, Fred’s goal (and mine!) was within reach, but it would all depend on finding an editor who also would be passionate about the novel. Unexpectedly, a few days later, I received a message from the publisher to please return her call. One out of the three editors who reviewed the manuscript was definitely passionate about the historical novel and wanted to start work on it right away. I was then asked by the publisher if I wanted to sign a contract as soon as possible, and of course I said, “Yes!”. It was an exciting moment I’ll never forget. The editor was willing to spend hundreds and hundreds of hours correcting the manuscript, reviewing dialogue, making suggestions, and possibly expanding some of the text. As a novice novelist I welcome the opportunity to make the novel a solid read. When I receive the manuscript back, which should be any day now, I’ll have two months to make all the necessary changes before it goes back to the developmental editor. Needless to say, it’s an unbelievable opportunity of a lifetime and I can’t wait to start the process. My advice to new historical novelists is to make sure you understand the research process. It’s time-consuming and hard to gather and cross-check facts that may be relevant when creating your characters. Chapter by chapter they emerged only after hundreds and hundreds of hours of reading and re-reading the research generated by my Orphan Building Research Team of three, including me. I was lucky to have them assist me because I now know it would have taken a few more years to gather 115 years of Fred’s building history. Perhaps Fred made this good luck possible? Have passion for your project and gather supporters as you travel the road to publication, as they provide you with unconditional support when you need it most. Be diligent and passionate about your novel. Multitasking will be the name of the game. Life will often step in and change your schedule. Stay focused and never give up until your novel is published! It happened in 2006 when this story was destined to be told. 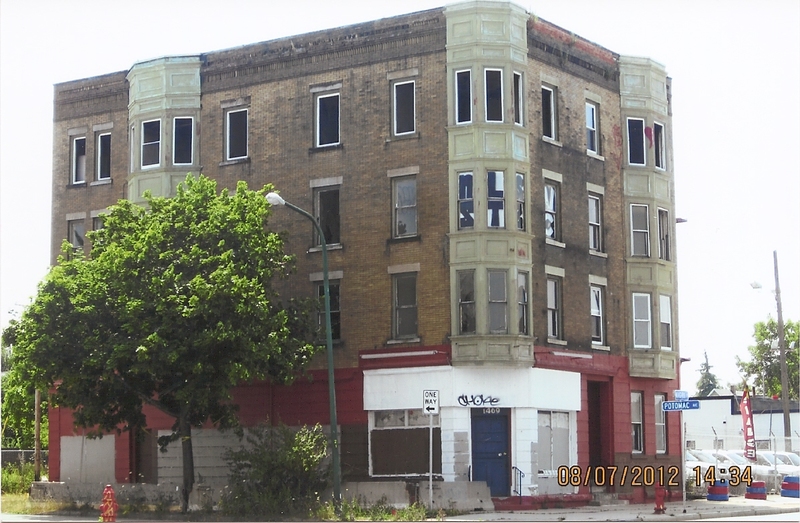 The building’s voice haunted me for another six years before I could begin the research on the dilapidated empty four-story apartment building located on the corner of Niagara and Potomac on Buffalo, New York’s West Side. It talked to me via mental telepathy, as I passed by on my way to work. In 2012, I vowed to find out why I heard the building’s plea. “Please tell my story before evidence of my existence is gone.” Now looking back in time, I realize it was the beginning of a compelling story waiting to be told about the legacy of many of “Fred’s” tenants and their families who lived in the building from 1900 through 2015. An Orphan Building Research Team of three was organized, including me and at the time, Pat, Janet and I were novice historical researchers. After six more years, we became seasoned researchers with a detailed biography of an apartment building growing up in the 20th Century and beyond. We couldn’t wait to find out who built apartment building 1469! Our team discovered that forty-two year old Irish-American Edward F. Pickett was the architect. His father was a laborer and his mother was a seamstress who lived on the West Side of Buffalo, New York. Edward was a go-getter and by 1895 he was employed by Bull & Brown, a local bicycle manufacturer located on Main and Chippewa Streets in the City of Buffalo, New York. There he became a department manager, skilled in developing bicycle-related patents. By 1896, he was Vice President and Secretary of the Non Punctual Tire Company. Within a year he was a draftsman for the Great Northern Fire Elevator Company, a storage facility. Our research team was amazed by his achievements and traced him as long as possible, but had to move on mainly because we had to find out was who building 1469’s builder and first owner? These important people in the history of 1469 Niagara St.; the architect, builder, and first owner, constructed the framework for an enormous cast of characters. The individuals arrived in my mind only after extensive research going back in time, year by year, reviewing major historical events in Buffalo and America, both nationally and internationally, focusing on the effects on immigrants, refugees, internal migrants, and descendants of enslaved peoples of Africa who arrived in Buffalo between 1900 and 2015. Each character revealed themselves slowly only after reviewing and re-reading research notes for hours and hours at a time. Then, there was a second and third wave of notes with character ideas that fit perfectly into the historical period of time. Gradually, all my characters felt like an extended family and I tried to make them speak the way they would if they were alive today. Each chapter was written and rewritten at least three or more times until I felt satisfied. Many character questions had to be answered. For example, why did they move into the building? What were their back stories? How did they handle hardships, loss, and despair? What happened to them in the future? How did they survive and have hope for life in America? Our team identified each tenant that lived in the building from 1900 to 2015, including their ages, occupations, family members, borders, and employment, knowing it was impossible to be completely accurate because of possible recording errors. It took about two years before building #1469 got the name Fred and readers of the unusual reason knew why first hand. Edward F. Pickett was a remarkable character and little did he know he was setting the stage for a legacy of many generations.